Scientists have demonstrated conclusively, with studies made over many years, that preservation of our hawk population as a whole is a strong economic need; and that indiscriminate slaughter of these birds is a nice figurative way of slitting our own throats. A national asset which has suffered terrible misuse through gross ignorance, is worth knowing about. Hawks, like humans, include good, "ornery", and just plain indifferent specimens. Broadly speaking, hawks are any members of the order of birds which ornithologists call Falconiformes, or the diurnal birds of prey. This includes, as of check list of 1931, about 290 species, and many sub-species, distributed over the entire land area of the earth except the extremes of the polar regions and a few isolated oceanic islands. The American Ornithologists' Union in 1931 listed thirty-seven living species and one extinct species (the Guadalupe Caracara) in North America north of Mexico, including Lower California. Some of these are divided into numerous sub-species, but for general purposes we don't need to worry about them. Moreover, we don't have to memorize thirty-seven different bird types, either, as will appear presently. This sizable grouping of feathered flyers includes such regal characters as the Bald Eagle, our national bird; and such plebian souls as the Turkey and Black Vultures; also the Falcons, the Buteos, or Buzzard Hawks; the Kites, and the true Hawks, or Accipiters. If you like superlatives, it can be said that this order includes the Duck Hawk, or Peregrine Falcon, the fastest of all birds; the vulture, the finest gliders in the bird world; and the California Condor, the largest North American land bird, which is also the largest bird on earth capable of soaring flight. He is probably equalled in size by the South American Condor. The role of the Falconiformes in our biotic scheme has been so completely misunderstood by farmers, hunters and sportsmen that most species have suffered complete and relentless persecution. The result is that as a group these birds are progressively diminishing in numbers, with some varieties on the verge of extinction. Ironically enough, the beneficial species suffer more from man's misguided zeal than the few highly destructive ones. To figure out in brief fashion who the problem children of the Hawk world are, we have to do a bit of sifting and sorting. We can readily eliminate the vultures. There are only three kinds in the United States, the Turkey Vulture, the Black Vulture, and the California Condor. The first two are so well known and are so universally recognized as completely harmless and very beneficial scavengers, that they are protected by law in most states, and are effectively holding their own. They simply are not adapted to the capture of live prey, for their talons are dull and only slightly curved, and the feet are clumsily formed. Their feet leave tracks of ground walking birds, rather than clutching birds. The California Condor is not so fortunate as his near relatives. While his principal food is carrion, he occasionally captures living prey, and has been accused by shepherds of killing young lambs and even sickly sheep. John B. Mays points out in his "Hawks of North America" that the reports are probably exaggerated, and that sickly sheep seldom survive on the open range, so that their destruction and conversion into food for vultures may eliminate them as sources of contagion for other sheep. At any rate the bird is so rare today that he is not an economic factor. Some observers estimate that not over a couple of dozen are left. One reason for their phenomenal decline, years ago, was the use by cattle and sheep men of poison for predator control. The poisoned flesh of the dead animals meant death to the scavengers as well. The Kites, of which there are four kinds in the United States, are among the most beautiful birds in North America, and their morals are above reproach. Birds are practically unknown in their diet. The White-tailed Kite eats great numbers of small rodents and insects; the Swallow-tailed Kite is an enthusiastic consumer of insects, small snakes, and lizards; and the Mississippi Kite, while too rare to be of economic consequence, eats similarly on insects, lizards, snakes, and frogs. The Everglade Kite is a peculiar epicure who apparently feeds entirely on a single variety of large snail, which seems of no harm or value to mankind. All of the Kites are in danger of extermination, and should be rigidly protected. The Marsh Hawk, the only North American Harrier, stands near the dividing line between virtue and iniquity. He certainly eats birds, but he also eats a lot of harmful rodents. He prefers to do his hunting over marshes and swampy areas, and is harmful or moderately beneficial according to locality and available food supply. Experts agree that in general he is worth protecting, except in individual cases where he shows a weakness for the poultry yard population or the game birds. The American Osprey, or Fish Hawk, is a highly specialized fish-eater. He is a long legged fellow, for a hawk, with large strong toes to hold his slippery prey, and a reversible cuter toe so that when he holds a fish the talons are paired for the best possible grip. Most of the fish he eats are of little comnercial or sporting value, although at times he is a bit of a problem around fish rearing ponds, and in such cases he may require control measures. In general, he is definitely deserving of protection. Ordinarily when an ardent fisherman encounters a fish-eating bird he conjures up wrathful pictures of all the fine trout, bass, and other game fish the feathered Walton is taking. Actually, it is a rare day when a fishing bird makes a noticeable inroad on desirable fish. Put yourself in the bird's place. Lacking man's highly discriminatory taste, if you found your fishing grounds abounding in carp, suckers, and other slow-moving, sluggish fish, would you run yourself ragged trying to catch the more elusive gamesters? Fish-eating birds really do the sportsman a service, for they catch mostly the slower, weaker, or sickly fish. Such selective elimination of unfit specimens leaves a healthier average breeding stock, thus working toward a sturdier breed of game. The Caracaras, while anatomically similar to the related falcons, are much like the vultures in their habits, and are largely carrion-eaters also. Unlike most hawks, the Caracara walks, instead of hopping, and can run freely and with considerable speed. He deserves complete protection, for the occasional bird or beneficial small animal or frog he takes is more than offset by the scavenging habits and the great numbers of injurious rodents and snakes he destroys. The Falcons represent a subfamily which is characterized by vigorous, powerful birds, with long narrow pointed wings, rather large heads, fairly long tails, and a dashing flight. The group ranges from the fastest living bird, the Duck Hawk, a large and very powerful species, to the dapper little Sparrow Hawk, the smallest and most brightly colored North American Hawk. The latter is one of the most valuable of all our birds of prey, for his food is very largely composed of injurious insects, especially grasshoppers. He also eats some destructive rodents, and a few birds. Unlike most other Falcons, his bird feed is of little consequence. He eats them mainly when there is a shortage of grasshoppers, field mice, or other natural food. He is something like a human. If a man can't get beef steak or pork chops for a long period of time, he has been known to compromise on horse meat. The Duck Hawk is the American representative of the Peregrine Falcons, which were much used in medieval Europe in the practice of falconry. Only high ranking persons were allowed to fly the birds. G. H. Thayer, in 1904, stated the Duck Hawk "is, perhaps, the most highly specialized and superlatively well-developed flying organism on our planet today, combining in a marvelous degree the highest powers of speed and aerial adroitness with massive, warlike strength." This hawk is so fast and powerful, and so predacious by nature, that he easily overtakes and kills pigeons, ducks, gulls, sand pipers, and many other game birds. When not hungry he becomes so playful he will at times herd other birds along the river channels, humiliating them to the extent of forcing swimming or diving birds to enter and go under the water to escape him. Then, on their attempted emergence, he darts at them until they lose the last shred of dignity and have to come up under protection of reeds or trees. He would be a real menace if he was common, but oddly enough he is comparatively rare. He is such a truly magnificent bird that it would be unfortunate indeed if he were to become extinct. 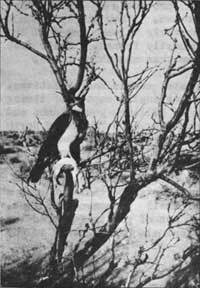 It can be said of the bird-eating Falcons in general that they are not common enough to call for control measures except in cases of individual raiders on poultry or game farms. The Accipiters, or true Bird Hawks, contain the most destructive hawk in the United States, the Cooper Hawk, often called the Big Blue Darter or Chicken Hawk. He has the typical short rounded wing and long tail of his group, and that length of tail guides him in remarkably quick and accurate maneuverings after his intended victim, a chase which often leads him into the heart of bushy clusters of leaves and branches. As an individual he isn't as destructive to larger game birds as his fierce relative, the Goshawk, but he is more numerous than the latter. He is no weakling himself, however, and can carry away a good sized chicken, grouse, or cottontail rabbit. He eats principally birds, but also likes squirrels and chipmunks. The slightly smaller Sharp-shinned Hawk has an equal ferocity and craving for bird meat, from quail, flickers, and robins on down. All of the Accipiters are common enough today that there is little immediate likelihood of extinction. Their habits are wonderful insurance, for they usually dart suddenly after their prey from sheltered wooded spots, and perch in inconspicuous nooks, frequently under leafy cover, and hence are hard to shoot. The large subfamily of Buteonine Hawks is essentially as different to the Accipiters as a professor of philosophy is to a blitzkrieg general. They are principally eaters of insects, mice, and other harmful rodents, and are more buzzard-like in habit and looks. They seem heavy and sluggish in appearance, and have short tails, with fairly long rounded wings. Being expert soarers, and too clumsy and slow to chase an incipient meal over a darting, winding course, they prefer to pounce suddenly on a victim. Their habits of perching in open, often conspicuous sports, the better to survey the feeding range, have caused them no end of trouble from farmers and hunters. While several varieties eat some birds and poultry, in no case are they important destroyers of our avian fauna. Almost without exception they merit general protection as valuable friends to our economy. The Red-tailed Hawk is a very good and common example of a Buteo. He is a large fellow, and almost always well marked in flight by his reddish tail. On the whole he is quite beneficial, but once in a while he wanders off the straight and narrow path to eat a chicken. In fact, some individuals develop an affectionarte regard for the taste of chicken meat, and have to be controlled. But because one person may go wrong is no reason to condemn a group. We can't condemn our human species because an occasional sinner carves his neighbor with a butcher knife. Under the law a man is declared innocent until proven guilty, and if we applied that principle to control of hawks a lot more justice would be done to beneficial birds. To show how circumstantial evidence, even to production of the corpus delicti, may frame an innocent Red-tail of murder, let's look at an illustration or two. The farmer catches the hawk in his field, eating on a dead chicken. It seems an open and shut case of the audacious killer caught while profiting from a foray. The farmer doesn't realize that the Red-tail, like most other buzzard hawks, sometimes eats carrion, and that the chicken may have died of old age, disease, or attack from an Accipiter which may have been frightened away. Suppose the farmer has set a trap by a dead bird. He catches a Red-tail, and thus convinces himself this hawk is a real chicken killer. A little study of hawks would teach him that the real killers, the Accipiters, seldom eat dead food and seldom return to a kill. Perhaps a poultry raiser sees a daring hawk steal a pullet out of his yard and make off. By the time he gets his gun in his hand, the only hawk he sees is a big fellow calmly perched on the top of a dead tree a short distance away. He shoots, and kills an innocent Red-tail, while the real culprit is filling his stomach under cover of the foliage of another tree. The man picks up the dead target and cuts it open to examine the stomach contents. Here he finds chicken fragments, and thus completely convinces himself he was correct. Yet the Red-tail may have been scavenging. The other Buteonine Hawks, to a person who has recognized one, can usually be distinguished from the Bird Hawks by the short tail. They range from mildly beneficial species to saintly characters who never touch a bird or chicken, with only scattered individuals who are lacking in the approved moral code. We can't be quite as charitable toward the Eagles, not even toward our national bird, the Bald Eagle. They slip from grace, but on the whole they are not destructive. Because of lack of economic importance and because of rarity they should be protected at all times except where individuals become predatory on domesticated animals. The Bald Eagle is not above eating a good supply of carrion. He spends most of his time along the sea coasts, lakes, and rivers, where he lives almost entirely on fish. He eats principally dead fish picked up on the surface of the water, although sometimes he robs an Osprey. Once in a while he fishes for himself, at which job he couldn't possibly pass an aptitude test. When he attacks a waterfowl it usually escapes by diving. He sometimes kills many rabbits, squirrels, mice and snakes. Having completed a birdseye view of our hawk population, it is well to stress a point or two which cover most of the regular and occasional bird eaters. A. K. Fisher, in "The Food of Hawks and Owls", from Birds of America, states a vital principle in maintenance of healthy game: "It is well known to poulterers and owners of game preserves that killing off the diseased and enfeebled birds, and so preventing their inter-breeding with the sound stock, keeps the yard and coveys in good condition and hinders the spread of fatal epidemics. It seems, therefore, that the birds of prey which catch aged, frost bitten, and diseased poultry, together with wounded and crippled game, are serving both farmer and sportsman." Birds of prey, along with other predators, are a vitally necessary part in Nature's control of over production. Rabbits and quail, for instance, are very prolific. They form important food for several varieties of hawks. Reduce the hawks, as well as owls, and other natural birds of prey, and you would have such over abundance of rabbits and quail that they would literally starve to death. Many graphic instances of what happens when predator control is carried to the extreme are matters of record, and they all reflect unhappiness to the farmers and sportsmen who initiated such elimination. It is significant that a great many of the depredations committed in poultry yards by the essentially beneficial hawks are the raids of youngsters less than a year old. Naturally a fast growing adolescent boy, with his cavernous tummy and his clumsy feet, isn't the graceful athlete he may be at young maturity; and likewise the young hawk is clumsier than the adult in capturing his food. The result is, he sometimes takes what is easiest to get, the domestic fowl, and if he survives to adulthood he then takes after the insect or rodent food which is the more elusive but more natural food for him. Some of the hawks whose normal diets include few birds have bad reputations because of their actions during nesting season, after the babies have come around to spend their daylight hours clamoring for food. A man will steal without compunction, if necessary to provide food for his children, where otherwise he wouldn't think of such a thing. So with hawks. They will take birds in far greater numbers with the echoes of posterity's ravenous demands in their ears than at any other season. All in all, hawks are a mighty useful adjunct to civilization. If you think of them as somewhat like humans, with their mixture of good and bad well distributed, but with the good usually predominant, you can have a much more sympathetic comprehension of the frailties which occasionally show up. We should have great admiration for their grace and complete mastery of the air; regard for their beauty, and respect for their prowess. 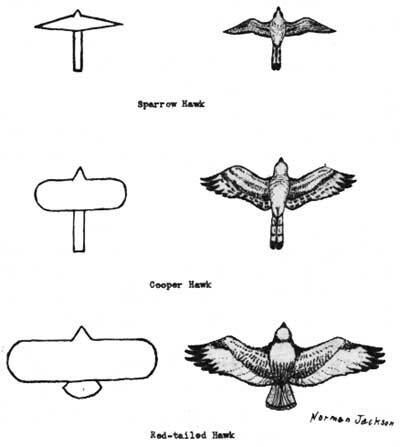 The above sketches give exaggerated and actual impressions from below of representative hawks of the three principal groups-the Fal cons, the Accipiters, and the Buteos.